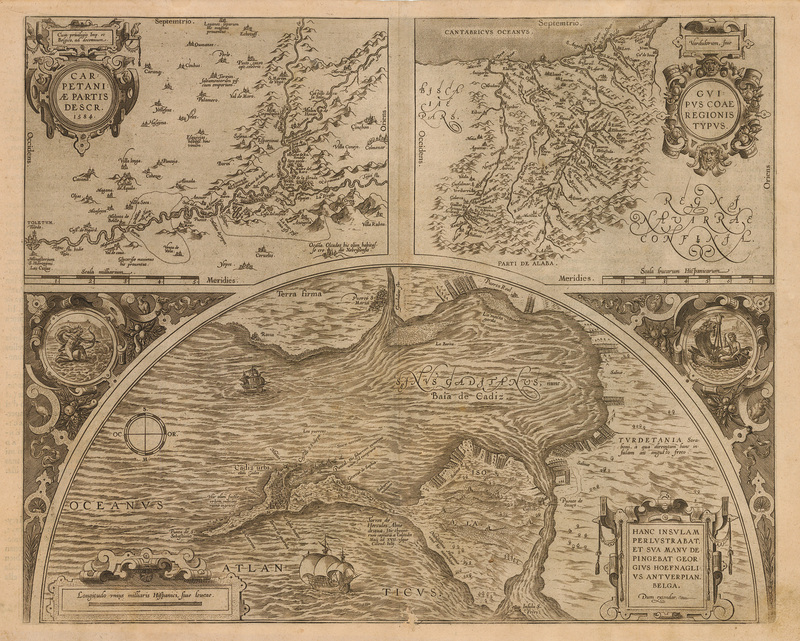 This antique engraving features three maps elegantly arranged on one folio sheet by Flemish cartographer and geographer Abraham Ortelius. The maps featured are of Toledo, the province of Cadiz, and Gipuzoka with its famous capital city of Donostia-San-Sebastien. Spanish text on the verso describes the map. Toledo is featured in the upper left of the engraving. Ortelius took pains to depict the topography of the countryside and the watershed of the mighty Tagus River whose headwaters are in the Sierra de Albarracin of eastern Spain, at a point about 90 miles from the Mediterranean coast. It flows westward across Spain and Portugal for more than six hundred miles to empty into the Atlantic near Lisbon. Its drainage basin is massive and is of vital importance to the economic development of both the nations through which it courses. In this inset are also depicted the cities and towns of the region. The semicircular map of Cadiz is from a manuscript map drawn by George Hoefnagel (credited in the Cadiz cartouche) during his stay from 1563 – 1567. It is of especial charm as Ortelius has included his signature seagoing vessels and with horizontal hatching depicted the ocean currents. The Cadiz inset also includes vignettes of fetching figures (perhaps Hercules) from antiquity serve as additional embellishment. The map of Guipuscae is remarkably accurate but from an unknown source. Located in northwestern Spain and bordering France, this is Basque country (adjacent areas of Spain and France) which has long been inhabited by this indigenous ethno-linguistic group. It is thought that they are descended from the peoples referred to by Strabo as the Vascones. Their history is interconnected with that of both Spain and France, dating back as far as the Neolithic era if not farther. The region around the capital city, Donostia-San-Sebastien, has been inhabited from great antiquity to the present, and is a favorite destination for tourists from around the world. Flemish cartographer and geographer Abraham Ortelius is generally recognized as the creator of the first modern atlas. He is also credited with being the first to understand that the continents had at one point been joined together before drifting to their current positions. Condition: This map is in B condition. A wormhole at the bottom edge of the centerfold has been repaired with archival material on the verso.